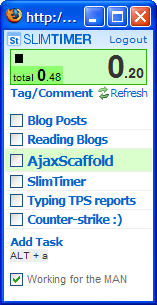 SlimTimer: A timer to keep track of time spent on work tasks. Because its much simpler to use than ordinary timesheets, web or otherwise, and you get more accurate data to boot. It has spiffy reports allowing you to easily digest your time data. You also don't have to fuss with setting up clients and projects... you just setup tasks, tag them for reporting purposes (like billable) and off you go. It's still evolving so the main improvements would be around making it scale better for larger teams. Also the reporting while sufficient still needs some extra features to allow customizing them to the rules of an individuals businesses. Fortunately, the creator is accepting and acting quickly on suggestions. PS. If you wouldn't mind using this image (http://static.flickr.com/69/194202689_3a2ddc03ed_o.png ) instead of the logo, I would appreciate it. a) Uh, don't be too surprised Richard, you submitted *yourself* to the site. b) 3 stars is a great score, look at your company. (remember, we don't review crap here, see the star ratings on this page).